Talking with Ormand Lionheart about the images in a video I made, he mentioned Dynamic Super Resolution. A bit of research shows this is a way to make your 2k-1920×1080 monitor look more like a 4k monitor. The keywords are “more like”. The video explains and shows what is being talked about. 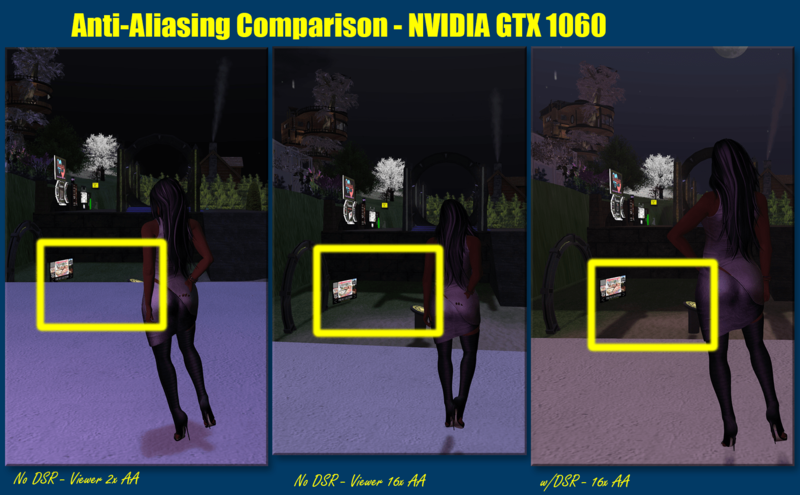 It touches on the fact that a 1080 or 2k monitor is physically limited to showing that fixed number of pixels. Nothing anyone can do will change that. You have 1920×1080 pixels, horizontal and vertical, for a total of 2,073,600 pixels. Those manufactured into the screen. To get more pixels you need a screen manufactured with more. 4k and 8k screens are showing up in stores. Sharp has a 27” 8K resolution with 7,680×4,320 pixel which is a pixel density rivaling modern smartphones. I can’t find a price for the 27″ but, the 85″ goes for US$125,000. 4k screens in the 27″ range are going for $2,100±. I won’t be upgrading for a while. This means that if I have an image that has 3840 x 2160 pixels (4k screen size) and I put it on my 2k monitor the system has to average a 2×2 set of pixels into a single pixel on my screen. Doing that improves the image. Shrinking any image makes it look better. And that is the idea behind DSR. One of the things that improves is the jaggies, those stair step like edges we see. We use Anti-Aliasing (AA) to remove those stair step edges and give us a smooth sharp edge. The viewer and most games have some type of anti-aliasing process. We can enable or disable the viewer’s AA and set the number of passes the viewer process makes; 2, 4, 8, or 16. The bigger the number the more work the computer has to do. I kept my GTX 560 computer set to 2x. There is a problem with using the video card’s AA, which is it runs the process on EVERYTHING in the viewer window, including the text. So, we see fuzzy text. Check the image. I wanted to see what DSR would do on my new system. While I was at it, I tried 4x, 8x, and 16x setting on the viewer’s AA looking to see what performance impact there was. None. Not 1 Frame per Second (FPS) difference. Huh! I turned on DSR 2x and 4x, 4 is the max on my DSR. I lost about 2 FPS using 4x. But, I can’t see a difference. The images are viewer captures set to grab a 3,000×1598 image. All that really matter is what you see on your screen. My images don’t necessarily show you what I see on my screen. Your video card renders the images and sends it to your screen. Your screen figures out what to show. 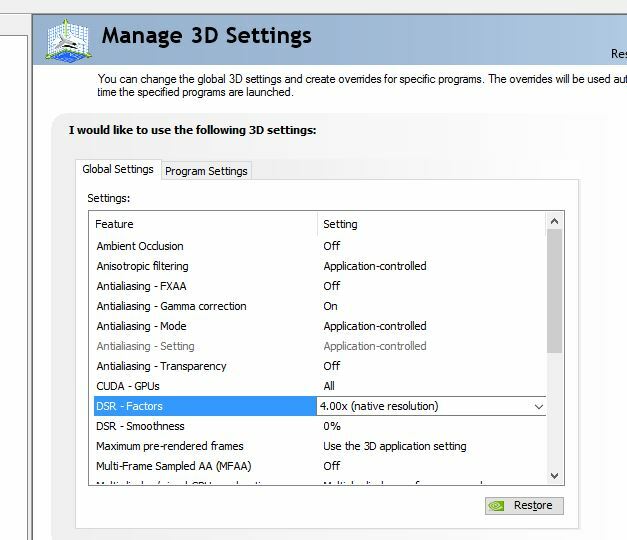 My point here is to alert you to the DSR feature now in NVIDIA control panels. Try it. See what it does for you. I’ll be trying it with other games. You can see that nVidia applies the feature to the entire screen. Thus the setting is only in global settings, not per game settings. This entry was posted in General Computer Stuff, Hardware and tagged photography. Bookmark the permalink. Nal note: Sorry. Your posts started going to spam. Just found them. With DSR there is on/off and a setting of 2x to 4x. How does one misapply DSR?